:Tiny books with Great truth! This little book is slightly bigger than the palm of your hand and yet, it is filled with wisdom taken from Scripture. 21 Promises God makes in his Word are highlighted and illustrated with Bible Verses. Use these little books as a tool for outreach in everyday life, on missions trips or simply to remind yourself of God's love. It also makes a great gift Sunday School Teachers can use to disciple their students. 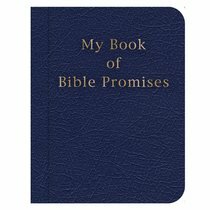 About "My Book of Bible Promises (Navy)"